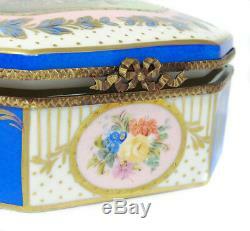 6968 Limoges Porcelain Jewel Casket. 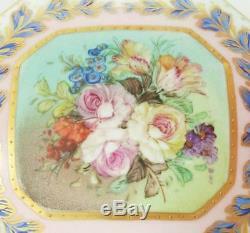 A Limoges porcelain jewellery box dating around the mid 20th century. 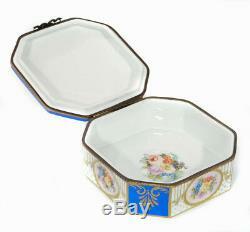 It is of canted square form with a slightly domed lid. 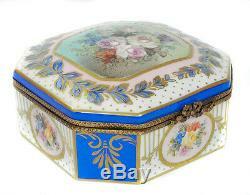 The box features gilt metal mounts and has a bow shaped friction latch to the front. The top is hand painted with roses and surrounded by a gilt and blue garland and there are further floral vignettes around the sides. To the interior is a painted floral vignette to the base of the interior. 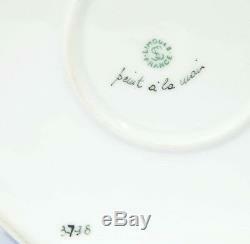 To the underside is the Limoges printed mark and hand painted script. Good order with little wear and no damage to the porcelain. Some deformation to the metal around the hinge location but the hinge and latch still working fine. If for any reason you are unhappy with your item please let us know as soon as possible, and we will do our best to put things right. 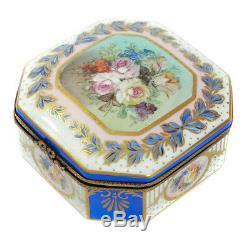 The item "A Vintage Limoges Porcelain Hand Painted Jewellery/Jewel Casket" is in sale since Wednesday, July 23, 2014. 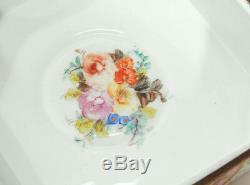 This item is in the category "Pottery, Porcelain & Glass\Porcelain/China\Limoges". The seller is "chrisbuckman" and is located in Lincoln. This item can be shipped worldwide.